A conservative Washington economic research organization has concluded that Republican presidential contender Donald Trump's vow to deport more than 11 million illegal immigrants from the United States would shrink the country's economy by about 2 percent. The American Action Forum said Thursday that nearly seven million of the immigrants, many of whom entered the U.S. from Mexico and Central American countries, work in the world's largest economy. Eliminating them from the U.S. labor market would cut between $381 billion and $623 billion from the country's national economic output, the group said. The think tank concluded that if the immigrants were removed from the work force, many of their jobs would remain unfilled because the most affected industries — farming, construction and hospitality — might not be able to find enough legal workers to replace them. FILE - In this July 17, 2014 photo, construction workers build a commercial complex in Springfield, Ill. The forum's president, Douglas Holtz-Eakin, said, "The things Donald Trump has said are utterly unworkable." The group earlier concluded that the deportation of 11 million people from the United States would cost the government $400 billion to $600 billion over a 20-year period. The American Action Forum said that if the plan were carried out over a two-year period, as Trump has proposed, it would require federal agencies to hire thousands of new personnel to apprehend the immigrants and process them through immigration courts before flying them back to their homelands. Trump surged to the top of the large Republican field of presidential candidates with promises to voters to deport the illegal immigrants already in the country, build an impenetrable wall along the Mexican border to halt the stream of more migrants and temporarily block Muslims from entering the country to thwart possible terrorist attacks. His proposals proved popular among Republican voters. He became the party's presumptive presidential nominee in the November national election this week after a resounding victory over his remaining challengers in a party primary in the Midwestern state of Indiana. But with his likely Democratic challenger, former U.S. Secretary of State Hillary Clinton, opposed to all three of Trump's immigration proposals, the issue is likely to be a key point of debate in the election. 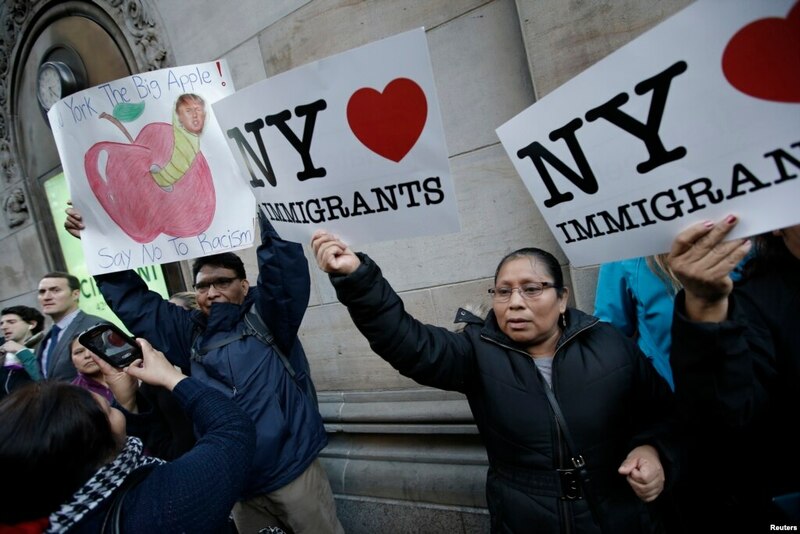 FILE - Demonstrators hold pro-immigration signs during a protest against Republican U.S. presidential candidate Donald Trump in midtown Manhattan in New York City, April 14, 2016. A new Pew Research Center poll Thursday showed that American voters view the country's role in the world with apprehension and concern, with 57 percent saying it would better if the U.S. paid more attention to its own domestic problems and let other countries fend for themselves as best they can. Trump at times has voiced a more isolationist foreign policy viewpoint than U.S. Republican figures normally do. The Pew survey reflected his campaign promises, with about four in 10 Americans saying that the U.S. does "too much" to help the world solve its problems, while the share jumped to 54 percent among Trump supporters. Nearly half of all Americans polled said they think U.S. involvement in the global economy is a bad thing because it lowers wages and costs jobs, rather than creating new markets for U.S. products. But 65 percent of Trump voters held a negative view of U.S. involvement in global markets.